Bengaluru turned on the style in an emphatic second-half performance as they stayed on top of the table with a 3-0 win over Churchill Brothers at the Bangalore Football Stadium, in Bangalore in the Round 20 clash of the Airtel I-League on Saturday. A Robin Singh strike sandwiched between a Sunil Chhetri double in the second half showed the resilience that Ashley Westwood’s side possesses after the Blues were being written off post the 3-2 loss to Rangdajied United last week in Shillong. Chhetri scored the first of his pair in the 56th minute and it came from sheer instinct for opportunity. Robin sent one in for Rooney whose shot bounced off the ’keeper and fell loose. The skipper, lurking nearby, pounced and tapped home the opener. The second came just five minutes later out of a nothing chance. Keegan Pereira picked out Robin from deep inside the BFC half and the striker rose to head past last man Sanjay Balmuchu before chasing the ball and putting it past a hapless Bhattacharya. Bengaluru found their stride and they wouldn’t let the momentum drop after that. Not content with a 2-0 lead, Bengaluru were all over Churchill and Chhetri was at hand to tap home again in the 89th minute. Failing to hold on to a strike by Robin, Bhattacharya’s save fell to Chhetri who took his time and calmly slotted home before going to the ’keeper and patting his head to acknowledge his effort. The win takes Bengaluru to 34 points from 18 games while Churchill’s quest for survival was handed a severe blow. Following the match, Sunil Chhetri’s goal tally in the competition went up to 12 – making him the highest scorer in the tournament so far. 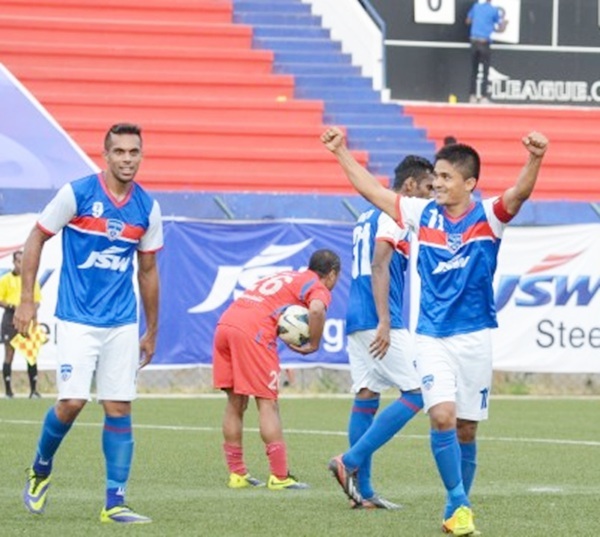 Image: Sunil Chhetri, right, celebrates his second goal of the match. Tolgay Ozbey scored twice as Dempo capitalised on Sporting Clube de Goa's shaky defence to score an impressive 4-0 win in Margao. Dempo, who led 4-0 at half time, scored through Tolgay (16th, 30th), Roberto Silva(18th) and Clifford Miranda (25th). 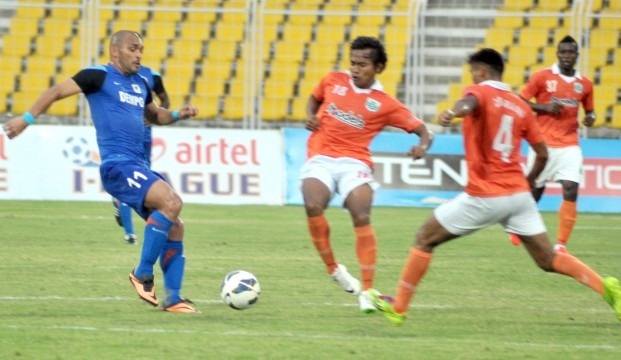 Sporting clube de Goa, who lost to Mohammedan Sporting in their last outing, could not afford to lose further as that would see them slip in the points table. Sporting started promisingly, but Kalu Ogba and Boima Karpeh missed the target narrowly. Tackles from their defenders Deepak Devrani and Keenan Almeida saw Sporting concede two penalty in a span of two minutes, and Dempo scored off both. Clifford Miranda found the target off Allwyn George's pass, for the team's third goal. Tolgay then picked a long ball from Miranda beat the rival defender and goalkeeper Ravi Kumar, to complete the rout. 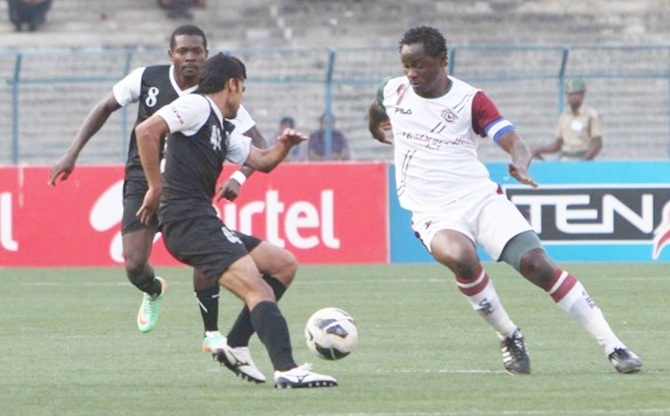 Mohammedan Sporting and Mohun Bagan played out a goalless draw at the Salt Lake Stadium, Kolkata. It was 0-0 back in November as well while two other clashes in other competitions this season also ended all square. The result takes Mohun Bagan’s points tally to 21 points from 19 outings while Mohammedan Sporting are on 17 with two games in hand. Mohun Bagan skipper Odafa Okolie was available again after returning from injury and was given the start by Karim Bencherifa. The Nigerian started brightly and also had the game’s first real effort with his glancing header narrowly missing the target. Mohammedan Sporting came into this game on the back of an impressive win over title-chasing Sporting Clube but their play lacked intensity and the approach was cautious. But Sanjoy Sen’s side could have taken the lead when Taro Hasegawa’s cross was nearly put into the back of his own net by Echezona Anyichie. Each side also had a strong penalty claim but referee T. Nagvenkar denied both. David Beckham looks hot and hunky!